Africa’s rapidly growing economies are catching the attention of property investors, with the retail sector becoming a major focus for activity. South Africa has a large and mature shopping centre market, with approximately 2 000 shopping centres across the country, covering an estimated 23 million m2 of floor space. According to the South African Council of Shopping Centres (SACSC), it has the sixth-highest number of shopping centres of any country in the world. New developments are opening regularly too, with one of the most recent also being the largest single-phase development in the country to date – Gauteng’s Mall of Africa. The 130 000 m2 Mall of Africa, which has a value of ZAR4.9 billion, is owned by leading South African real-estate capital growth fund Attacq Ltd, which holds 80%, and developer Atterbury Property Developments owns the remaining 20%. Notwithstanding its mammoth size, provision was already made in its planning for a future expansion of 25 000 m2. CEO of Attacq Morné Wilken calls Mall of Africa the ‘jewel in the Attacq crown’, and says there was a ‘huge gap in the market’ as far as the Waterfall area was concerned. He adds that the development will act as a catalyst for economic activity in the area, with a potential annual turnover in the region of ZAR4 billion for the retailers. According to Wilken, property is a long-term asset, especially the right retail mall in the right catchment area, and he notes that Attacq’s strategy is based on long-term sustainable capital growth. ‘The market will go through cycles and, given Attacq’s long-term view, it still makes sense to develop an asset like Mall of Africa. Mall of Africa-type developments do not come around that often,’ he says. While he says that the space for another super-regional mall is ‘very limited’, he believes there are still opportunities for convenience retail as well as the redevelopment of existing malls in good catchment areas. Indeed, Gauteng will soon be getting another ‘mega-mall’, with ground already having been broken in Fourways, and the development scheduled for completion during 2018. Being built through Accelerate Property Fund, in partnership with the Fourways Precinct, the huge endeavour will see the expansion of Fourways Mall as it joins with other centres in the area to cover a total of 175 000 m2 under one roof. This will make it Gauteng’s largest mall – outstripping both the Mall of Africa and Sandton City (128 000 m2) – South Africa’s second-largest mall. Durban’s Gateway, at 220 000 m2, remains the largest. Robert Broll, retail leasing consultant at Broll Property Group, says he does not think that South Africa can accommodate too many more super-regional malls. The Broll group is a leading property services company in sub-Saharan Africa that is active in 16 countries. It focuses on, among other things, property management, commercial, industrial and retail leasing, and facilities management. ‘When you talk to South African retailers, one of first things they speak of is rate of cannibalisation. We’re finding a lot of the existing super-regionals are upgrading and extending to counteract the new malls going up,’ says Broll. Safari’s niche focus has served it well: what started in the 1990s as a small company comprising private investors is now a JSE-listed entity with 19 properties in its portfolio, totalling just shy of 154 000 m2 of gross lettable area and valued at ZAR2.2 billion. The company’s first development remains its largest – Denlyn Shopping Centre in Mamelodi, Gauteng, with 42 200 m2 of floor space. Kruger says the company is bullish about the future, but won’t be venturing too far into Africa at this point. While the firm currently has one mixed-use development under way in Namibia, this is its only African venture for now. As a whole, sub-Saharan Africa is experiencing noteworthy growth in modern mall development, largely owing to the growth of its consumer markets, as well as its rapidly expanding urban populations and metropolitan areas. Property consultancy Knight Frank and the SACSC estimate there to be currently about 3 million m2 of shopping centre floor space available in sub-Saharan Africa (excluding South Africa’s 23 million m2). Second to South Africa in term of retail developments and shopping-centre space is most certainly Kenya – more specifically, Nairobi, with around 400 000 m2 of shopping-centre space and 470 000 m2 in the pipeline. Recent developments include Garden City Mall (first phase, 33 000 m2) and Two Rivers Mall (62 000 m2). According to Knight Frank, Windhoek in Namibia and Gaborone in Botswana are the next largest markets by floor space (260 000 m2 and 247 000 m2 respectively), followed by Kampala, Uganda at 182 000 m2 and Harare, Zimbabwe at 178 000 m2. 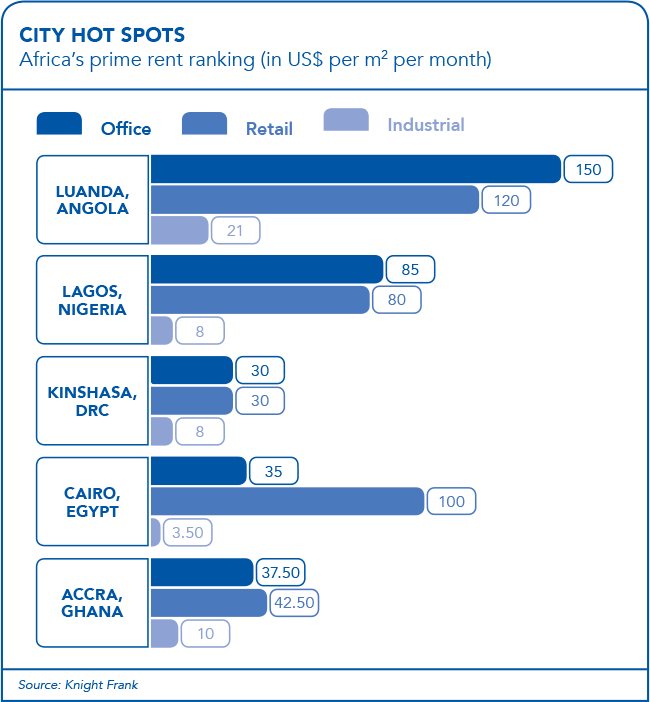 It is interesting to note that mega-cities such as Lagos and Kinshasa – despite their immense size – have much less floor space for retail than the aforementioned Southern African cities, perhaps an indication of how much growth is still needed in those retail markets. One of the main factors driving ongoing development is demand. ‘In Africa you’ve got an emerging middle class with a relatively small amount of formal retail space and opportunities,’ says Broll. Bronwyn Corbett, CEO of listed Mara Delta concurs. ‘When it comes to retail centres in Africa, we are very particular,’ she says. Mara Delta is the largest pan-African-focused real estate fund operating on the continent outside of South Africa, with assets in Zambia, Morocco, Kenya, Mozambique and Nigeria. ‘We do not see scope for malls larger than around 15 000 m2 at this stage and fundamentals such as dominance, local expertise and tenant mix remain key.’ Mara Delta recently acquired interests in three large retail centres in Zambia from Rockcastle Global Real Estate Company. ‘These centres have proven very defensive, notwithstanding the international commodity market slump. Vacancies are zero, and there is strong demand from new tenants. We believe it is because these centres cater for shoppers’ everyday needs with minimal focus on luxury brands,’ she says. Wilken agrees that numerous possibilities exist on the continent. ‘Africa’s facing a number of headwinds at the moment but the long-term fundamentals remain, with high rates of urbanisation and higher-than-average growth rates,’ he says. The retail segment is certainly a thriving sector of the property-development industry – one that is unlikely to see any halt to its acceleration anytime soon.